I’m so thrilled to introduce to you Debi Shawcross and her new book, Friends at the Table: The Ultimate Supper Club. I have a small group of friends here in my hometown that regularly get together nearly once a week for a dinner party. We often rotate houses, and of course the gathering is built all around the menu for the night. While our dinners are very casual, I really enjoy the idea of a formal “Supper Club” that was popular in the 30’s and 40’s and often included live entertainment, a set menu and beautifully decorated tables. These days, the Supper Club (or Gourmet Club as some call it) comes in many different flavors. Some still celebrate just like in the 30’s and 40’s with a live band (big band or swing music!) and others are a bit more informal (girlfriends getting together once a month.) But the one thing they all have in common is a love for food. p.s. I’m also giving away a copy of the book! What an honor to have a guest spot here on Steamy Kitchen today. Thank you, Jaden! A traditional supper club in the 1930s and ’40s was a gathering place for people to meet and enjoy an evening of fine dining, drinks, and usually live musical entertainment. The setting was semi-formal, which means men’s attire may have required a tie. The menu often included “surf and turf,” mashed potatoes, and Yorkshire pudding. It was a time when people made time for one another, and the evening was centered around food and lively conversation. My new book, Friends at the Table: The Ultimate Supper Club shows how to take the elements of supper clubs gone by and re-create them in an evening of fine dining at home, without the expense of a restaurant. Included are ready-made grocery lists and plan-ahead tips to ease the stress of entertaining, as well as full menus with a variety of themes to help execute a gorgeous meal, making the experience as enjoyable for the hostess as it is for the guest. The planning has already been done, from shopping lists to easy-to-follow recipes and from selecting music to creating a beautiful table décor. I’ve included menus that are grand and elegant, some more casual and ethnic, and some a mix of all them all; designed with the idea of job sharing the menu with friends, so that you won’t spend all day in the kitchen. 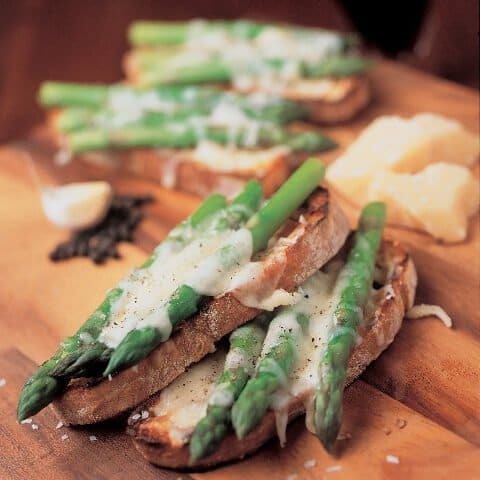 Here’s a grilled bread appetizer recipe that features the irresistible a combination fresh, springtime asparagus, garlic, and cheese. Just be sure to pace yourself, these crunchy little starters are pretty addicting! Grill bread slices over medium high heat until golden brown on both sides. Rub one side of the bread with garlic; brush lightly with oil. Place in a single layer on a baking sheet. Preheat broiler. Bring a large saucepan of water to a boil over high heat; add a generous pinch of salt. Add the asparagus and cook until tender, 3 to 5 minutes. Drain the asparagus and set aside. Combine the Monterey Jack and Parmesan in a bowl. Sprinkle two-thirds of the cheese evenly over the ciabatta slices. Arrange 3 asparagus spears on top of each slice. 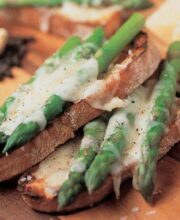 Sprinkle the remaining cheese over the asparagus, dividing evenly. Season with salt and pepper. Broil until the cheese has melted, 1 to 2 minutes. Remove from the oven and cut in half. Congrats Debi with your new cookbook! Love your idea of sharing making the dish with friends. It’s what I do when friends come to dinner, work for food, yay! I love asparagus too. 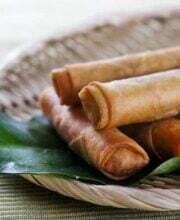 It is also taste good if wrap it with bacon and grill. What a fun idea for a book! I am on the look out for it now! That bruschetta looks absolutely amaing. You have me very close to emailing my girlfriends and starting something like this. Sounds so fun and I love basing get togethers around a menu or theme. 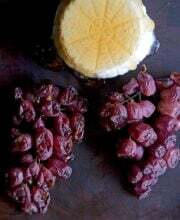 Great post and awesome recipe! Hi Jaden and Debi – the bruschetta photo is lovely! We hold a quarterly Supper Club event so I have been meaning to buy the book, and I am excited to see your tips for beautiful table decor (my hobby). I’m off to amazon right now! I’m going to be so sad when the fresh asparagus is gone. I’m loving it! This sounds amazing! I really need to think about getting a supper club together. Great idea!